In Aleppo City, in 2013, young Amina’s life is changed forever when a bomb destroys her neighborhood and her family joins the millions of refugees fleeing Syria. 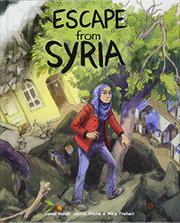 In this graphic novel, Amina uses flashbacks and spare text to narrate her journey from living a happy life in Syria to resettling in Canada as a refugee. Amina is a bright student whose favorite part of the day is returning home from school, where she is greeted warmly by her grandfather and then reads books in the home of her uncle, a professor. This life ends with an explosion on the second page. Her family flees to Lebanon, where they end up in a refugee camp when their savings run out. Amina is lucky to get a spot in the overcrowded schools, but when her brother falls ill, the family must make a series of heartbreaking decisions in order to pay for his lifesaving medications. When the stress of renewing expensive visas becomes too much and unethical smugglers make life impossible, Amina finally finds help with a resettling agency. The story wraps up quickly from there. Based on Kullab’s extensive experience with refugees, the novel skillfully depicts situations and drastic decisions many Syrian refugees face. The graphic-novel format is perfect for the story, using cinematic techniques to propel the story and adding poignant notes, as when Amina’s father reads a text message asking for help and conceals it from her. Extensive endnotes highlight the true events referenced in the book.